River Trip 2017 was gonna be epic! We researched locations and picked the Red River through Vietnam from China to the South China Sea. We booked flights and purchased “Do It Yourself” inflatable pack raft kits to build our own boats. Unfortunately, after countless hours and multiple tubes of seam sealer, my raft still didn’t float, and Ryan’s didn’t either. Plan B.
I landed in Hanoi, dropped my bag at the hostel, and Ryan took me to the beer corner for 50¢ bia hơi drafts where we formulated a new plan for our month in Vietnam. Instead of boats, we’d rent motorcycles and explore the country via pavement. 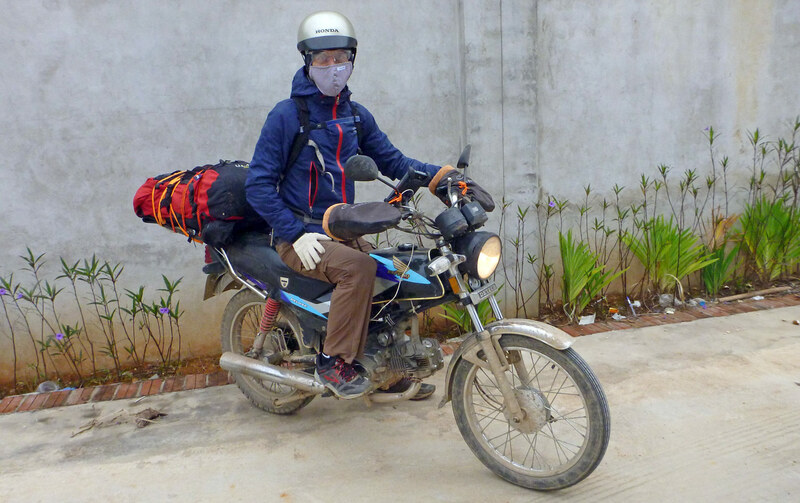 The next day, a little foggy from the bia hơi, we picked up motorbikes, strapped our packs on the back, and wheeled out of the city. 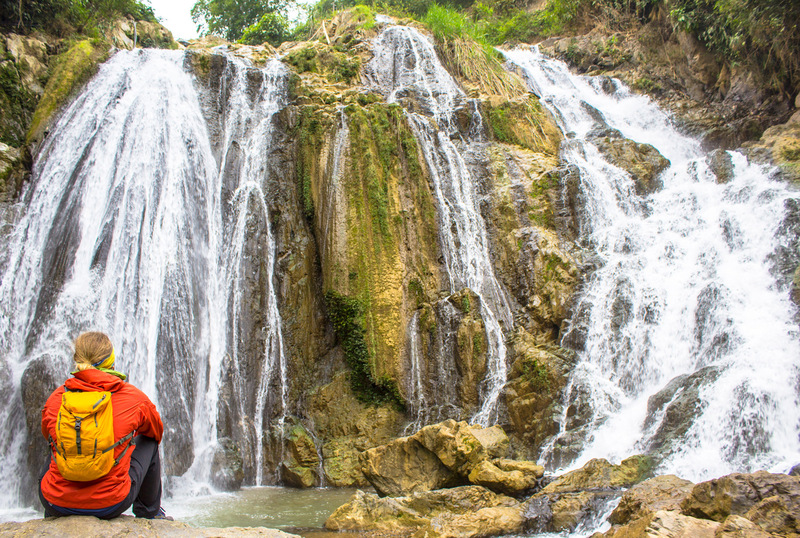 From Ninh Bình we rode through the limestone karst mazes of Tràng An where King Kong: Skull Island was filmed and visited Vườn Quốc Gia Cúc Phương National Park to explore some caves. On the way back to the main road a rooster decided it was time to run across the road in front of my motorbike. It wasn’t a good idea. I tried my best to avoid the collision, but he ran straight into my front wheel and careened off the road, floating sideways about 3 feet in the air flapping his wings uncontrollably. I’ll never forget that sight, as well as seeing Ryan behind me laughing hysterically. He pulled up beside me and told me that I owed the farmer a new alarm clock. After the poultry accident we thottled on to xóm Chiềng Sại, a village perched on stilts above rice paddies. We were the only guests in a small homestay and shared dinner with the owner and his entire family, which included more rounds of clear rice wine than I preferred. 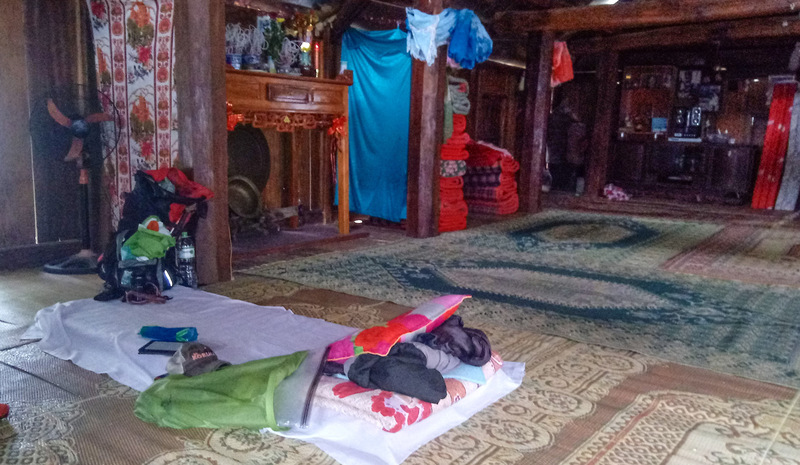 Eventually we laid out our sleeping bags on mats in the second floor of a large house built entirely of bamboo by the owner and his father. In the morning we shared another family breakfast, loaded our bikes, and hit the road…kinda. My motorbike wouldn’t start. 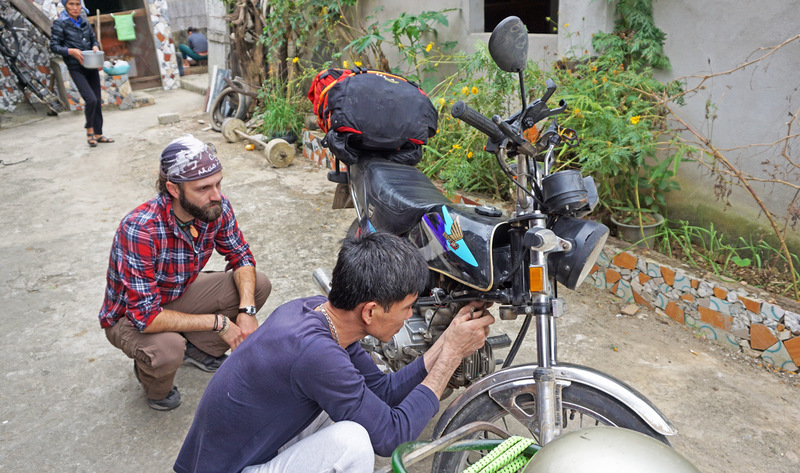 No problem though, the owner of the homestay had a similar bike and in no time he had both disassembled and was interchanging parts to find the problem. He targeted the starter, but didn’t have a spare, so I got on my bike, strapped on my helmet, and with his bike he pushed me downtown to his friend’s mechanic shop. We were loosely creating a clockwise loop around Northern Vietnam, connecting large cities and taking as many back roads as possible. One route led us through a valley decimated by a flood, the road washed away and replaced by kilometers of mud, rocks, and ruts that our motorbikes navigated efficiently, but worked every muscle in my body to stay upright. The road turned into a single lane path and climbed straight up a mountain, so steep that just stopping risked rolling the bike backwards all the way back to the bottom. 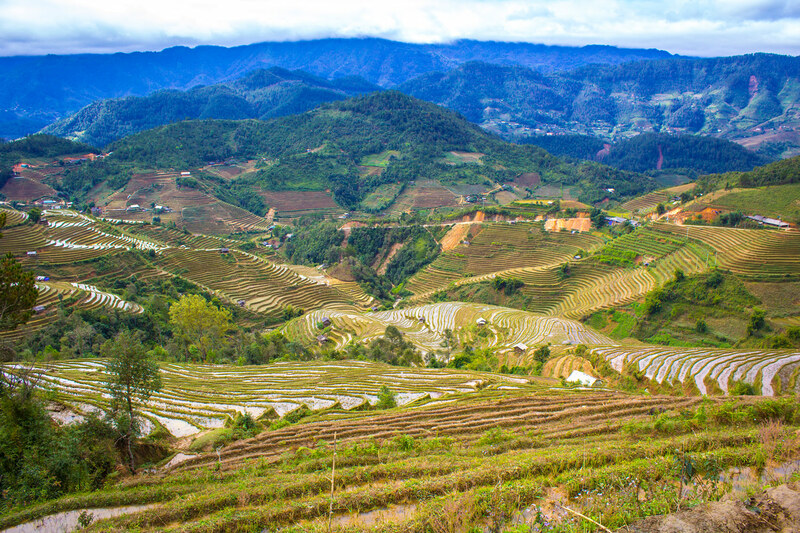 We crossed a single lane creaky wooden bridge and through picturesque terraced fields. We spent another day riding through cold rain and when we rambled into a remote village the only hotel in town had a small fire going on the patio. Sold. 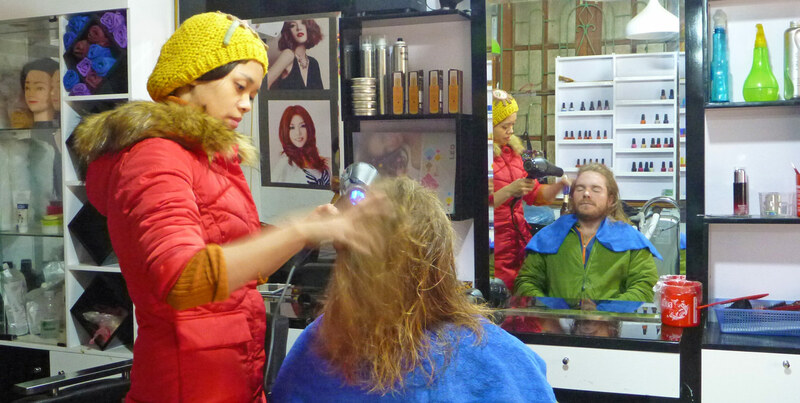 We were the only tourists in town and the next day with more rain in the forecast we stayed put, visited the market, ate a duck (the whole thing), and relaxed at the spa, getting manicures and our hair washed and blow dried. Spa day was fun, but we had more mountains to explore, so we continued on to Sa Pa and arrived again in drizzly cold rain. We checked into a hotel made out of shipping containers and finally reached our breaking point. The hotel didn’t have hot water, or heat, and no matter how many beers we drank, we couldn’t get warm. In a karaoke bar where the only person singing was the bartender, we decided we’d had about enough of winter. 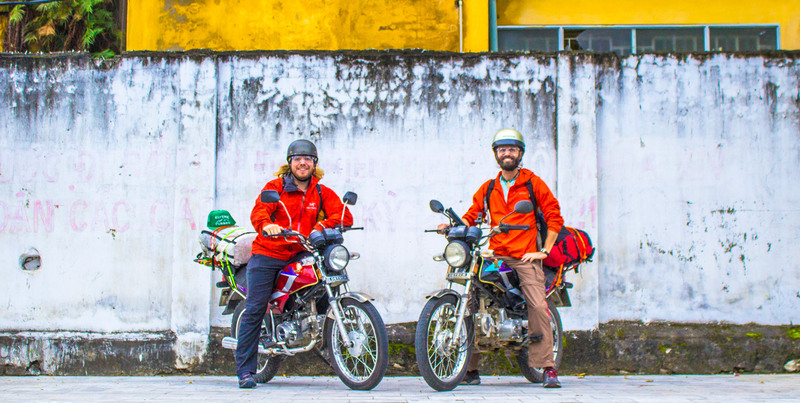 Over the next 2 days we rode the motorbikes back to Hanoi, returned them early, visited the beer corner, and booked flights to Myanmar to find warmer weather. With a few days to burn while we waited for our visas we caught a bus from Hanoi to Cat Ba Island. All the cold weather finally caught up with me and as soon as we reached our hotel I collapsed in bed for 15 hours. 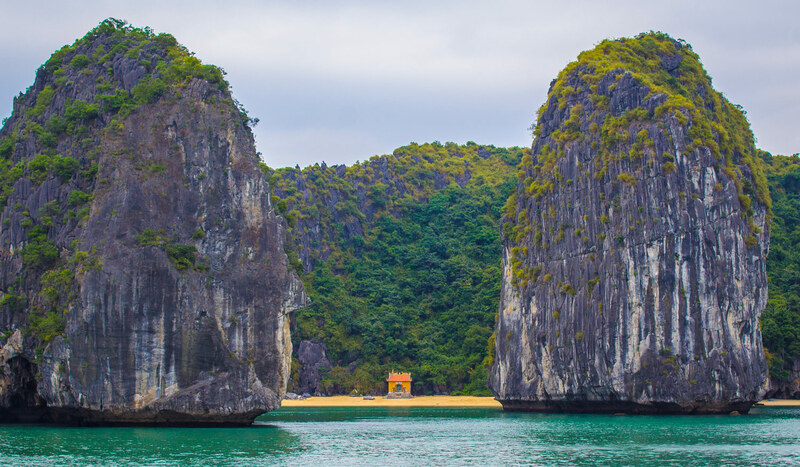 The next day I felt like I’d kicked the oncoming cold and we boarded a boat to explore the giant limestone karsts, check out floating fishing villages, kayak through caves, hike to the top of monkey island (while being chased by monkeys), and dive off the boat for a swim in the bay. 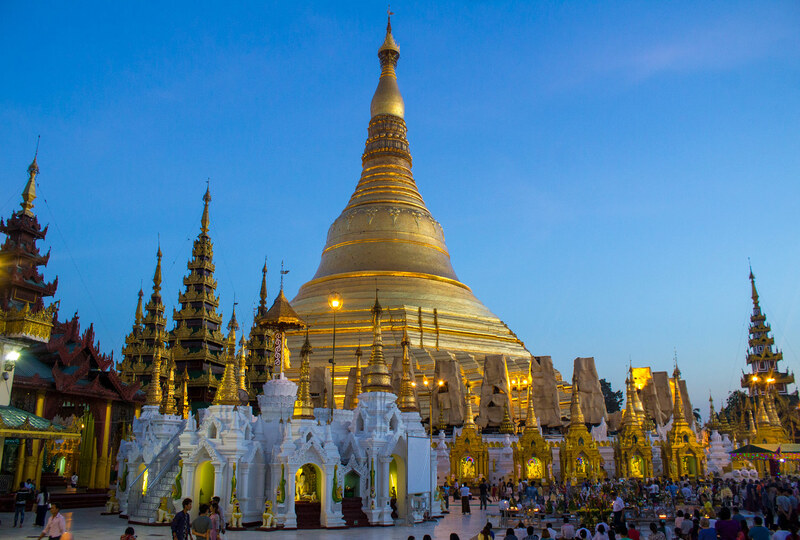 Two days later we landed in Yangon to warmer weather, less chaotic streets, and more aggressive street vendors. We toured the city, watched sunset at Shwedagon Pagoda, and took a boat across the river to the villages on the south shore. 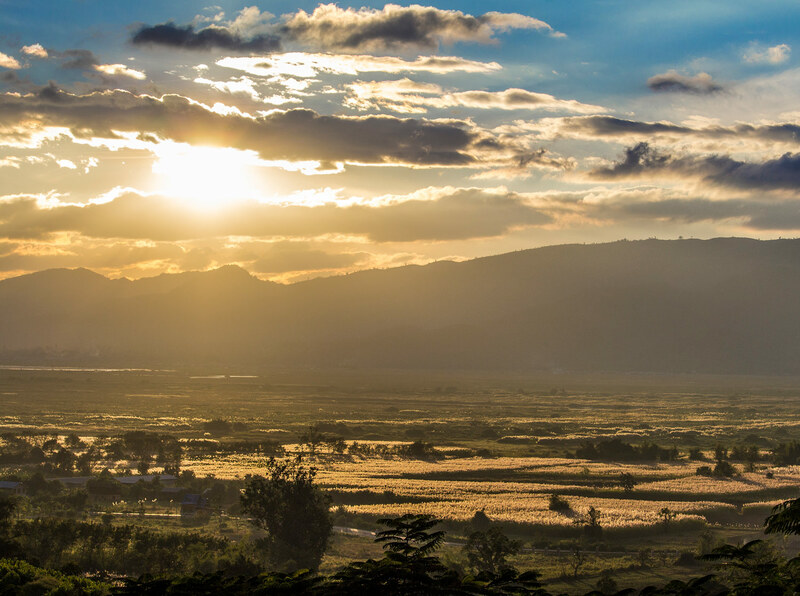 From Yangon we hopped on an overnight, 12 hour bus to Inle Lake. Unfortunately, a mouse was also on board and all night we were startled awake as it scurried back and forth across our laps. 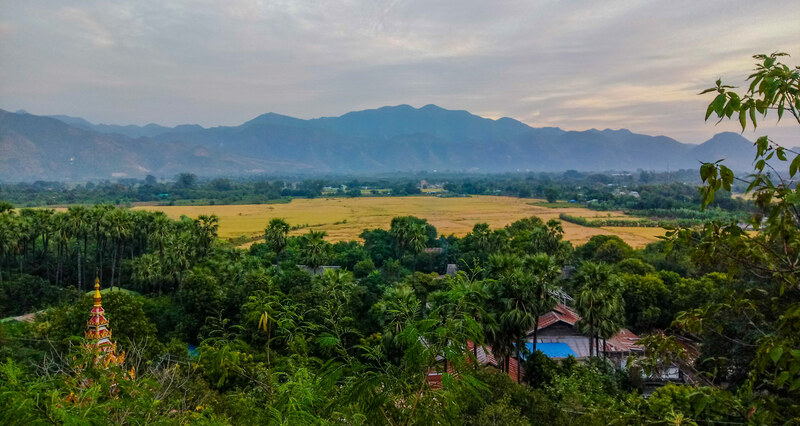 At Inle Lake we rented bikes, rode south along the shore, took a boat across the water, and watched sunset from a winery overlooking the mountains. Our last stop in Mynmar was Mandalay, where Ryan’s friends from New York were working as teachers in a local school. We rented motorcycles and rambled out into the mountains for the weekend. 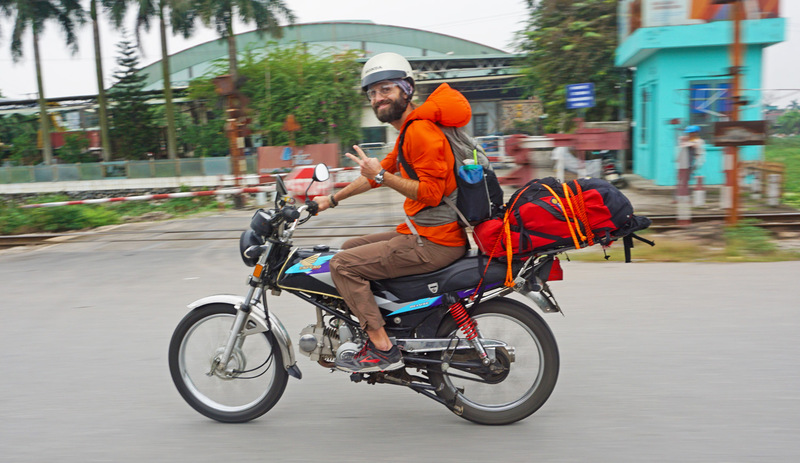 After a few days of good coffee, waterfalls, mountain roads, and excellent street food, we returned the bikes and prepared to fly back to Vietnam and wrap up our trip. Unfortunately Ryan’s visa for Vietnam was mixed up and he had to stay in Myanmar another day to sort it out. I made it to Hanoi and waited for him to join me at the beer corner. His trip was coming to an end, but we hung out with new friends from the hostel as well as some guys I knew from Ball State who were living in Hanoi at the time. 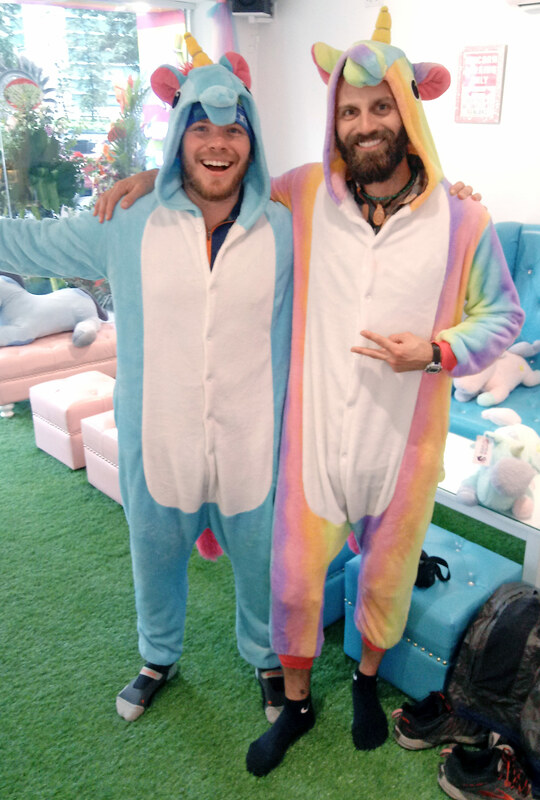 The last thing we did before Ryan returned to the States was stumble across a unicorn themed cafe where you don onesies and sip florescent fluffy drinks while listening to whimsical music. It was the perfect way to end River Trip 2017! 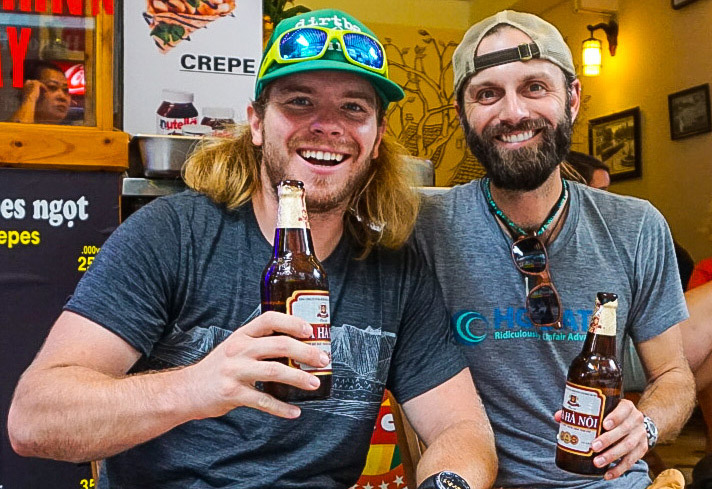 Although our Vietnam trip was over, I wasn’t ready for winter, so I booked a flight south to chase the warm weather to the Southern Hemisphere, joining my other buddy Ryan for a summer down under!